Mechanical watch movements don’t change much. Some of today’s most popular movements have remained essentially unchanged for more than 40 years. That’s why Eterna astonished the watch world recently with an entirely new technology that has re-invented the hand-wound mechanical movement. Their innovation is called the Eterna Spherodrive, and it is an entirely new type of mainspring barrel. Every mechanical watch has a mainspring at its heart. Since a fully wound mainspring can exert immense pressure and friction on the rotating arbor shaft that transmits the spring’s energy to the watch gear train, the ruby bearings that suspend the shaft have always been considered a mechanical watch’s weak point. 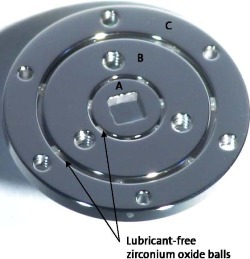 Instead of lubricating the rotating arbor with viscous oil like most manufacturers, Eterna re-invented it. The Eterna Spherodrive replaces the traditional lubricated ruby bearings with a double row of lubricant-free zirconium oxide ball bearings. This new technology provides an extremely stable, precise and almost frictionless connection between the mainspring and the gear train. The Spherodrive also changes the way the winding stem connects to the mainspring barrel, effectively avoiding the connection unless it’s necessary. Why is this important? It all comes down to accuracy. How the mainspring transfers energy to a watch’s gear train plays a huge role in determining the accuracy of the watch. That’s why watch enthusiasts around the world are so excited by the Eterna Madison Spherodrive Collection. Inside this understated, traditional looking men’s watch is the all new Eterna in-house Caliber 3505 movement with it’s revolutionary Spherodrive technology. This elegant and innovative new moment provides up to 56 hours of power reserve and offers a degree of accuracy and reliability that was simply not obtainable before. The Madison Three Hand with Eterna Spherodrive is a watch that purists will love. This hand-wound masterpiece features an anti-reflective sapphire crystal and sunray brushed dial with a special opening at 6 o’clock to showcase the Spherodrive bearings. The Caliber 3505 movement is housed in a handsome polished stainless steel Tonneau case and is fitted with a black alligator band with folding deployment clasp. If you are interested in acquiring one of the first real innovations in mechanical watchmaking in decades, contact your Eterna Watches dealer immediately and reserve your Eterna Madison Three Hands with Spherodrive today. It is a little known fact that very few watchmakers actually develop and manufacture their own movements anymore. 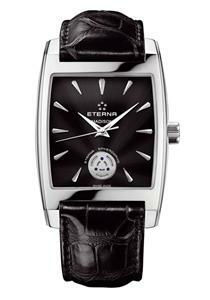 Eterna is one of a very few brands worldwide that still do. The Eterna Vaughan Big Date — named for Philip Vaughan, inventor of the ball bearing — was developed entirely in-house and is a superb example of traditional Swiss watchmaking at its very best. The Vaughan Big Date features Eterna’s spectacular new 3030 calibre movement. This innovative lens shaped movement, developed entirely by Eterna engineers, is modeled after the famous Eterna 1504 movement from the 1960’s. This innovative mechanism is currently the world’s thinnest automatic movement with a domed big date function. The convex, lens shaped movement features two concentric cambered date disks that rotate side-by-side, instead of being stacked on top of each other like the flat horizontal date disks found on most automatic watches. As a result, the 3030 calibre movement is able to be housed in a slim, exceptionally smooth case that mirrors the compact lens shaped mechanism. This high quality mechanical timepiece will appeal to purists and admirers of elegant restraint. The 27 jewel, 42mm watch features a sapphire crystal, classic dauphine hands, subtle applied minute markings, a sunray brushed cambered dial and a screw down back. The movement itself is a work of art, with blued screws, rhodium-plated bridges decorated using traditional Perlage and Côtes de Genève engraving techniques on the on the main plate and rotor. Three ceramic ball bearings in the date mechanism help reduce friction and play to a minimum, and the large date display switches over in a matter of seconds at midnight, instead of taking hours like some automatic movements. The Vaughan Big Date is a watch that the wearer will want to pass on to his children and grandchildren. This classic timepiece is available in rose gold or stainless steel and comes fitted with an elegant brown or black Louisiana alligator strap. If you are interested in acquiring this superb example of the watchmaker’s art for yourself, contact your Eterna dealer immediately and reserve your Eterna Vaughan Big Date today. Not only is the KonTiki the most well known collection in the Eterna line, it is arguably one of the most well known watches in history. When Norwegian explorer and writer Thor Heyerdahl embarked on his famous 1947 voyage across the Pacific Ocean in a small balsa wood KonTiki raft to prove that pre-Columbian civilizations in South America could have settled the Polynesian Islands, he took an Eterna timepiece with him. This sturdy, waterproof watch survived the rigorous expedition and later developed into the Eterna KonTiki sports watch line. 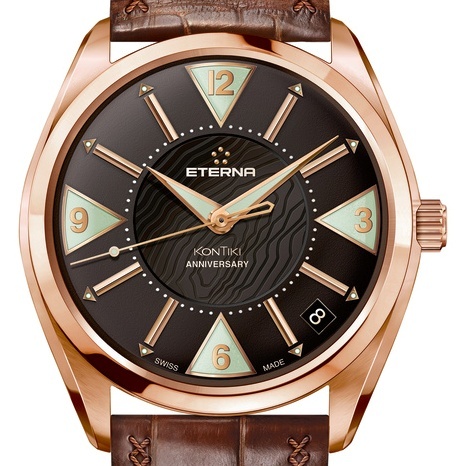 The KonTiki Rose Gold Limited Edition Anniversary Watch pays homage to the original KonTiki sports watch, which was first manufactured by Eterna in 1958. The dial features a silhouette of the Raroia Atoll, the unintended — but successfully reached — final destination of the KonTiki raft. Gold plated, triangular index marks, a domed dial, luminous hands and a screw down back also pay homage to the original KonTiki design. This special anniversary edition is equipped with an automatic Eterna 3010 movement with a fast change date. Only 50 of these exclusive satin finished red gold watches have been produced to honor the 50th anniversary of the Eterna KonTiki line. For authenticity, this 40mm anniversary model is slightly smaller than other models in the current KonTiki collection. Each KonTiki Rose Gold Limited Edition Anniversary Watch features an engraving of the KonTiki raft on the screw-in back and is water resistant at up to 660 feet. The brown crocodile strap, with its unique crossover stitching, was inspired by the hawsers used in the construction of Heyerdahl’s balsa wood raft. Each of these exclusive watches is delivered in a handcrafted traditional Polynesian box sporting the KonTiki sun god motif. The original KonTiki sports watches have become the Holy Grail for watch collectors around the world. Now, a few very lucky people have an opportunity to own an elegant and very exclusive homage to Thor Heyerdahl’s famous watch. 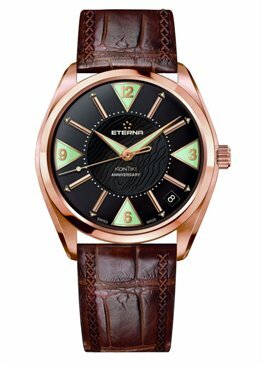 If you are interested in acquiring one of these impressive watches for yourself, contact your Eterna dealer immediately and reserve your KonTiki Rose Gold Limited Edition Anniversary edition today. 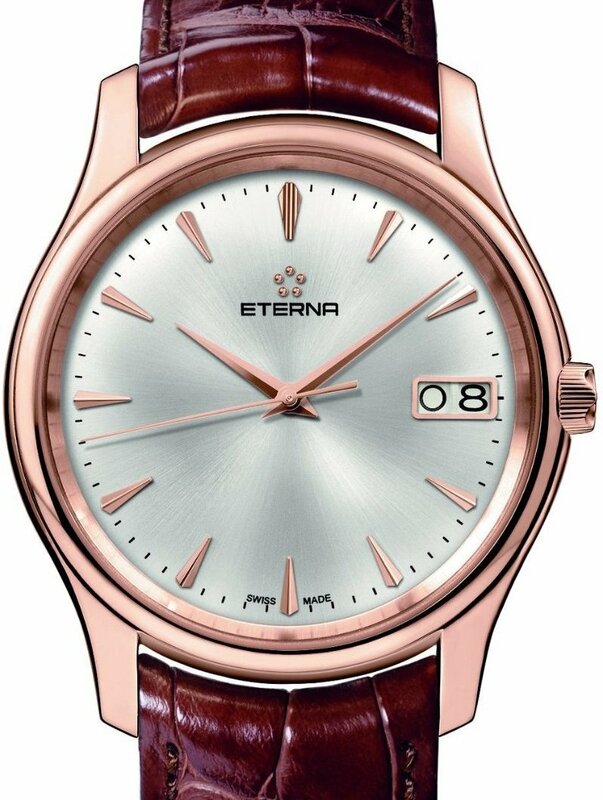 Eterna practically invented the woman’s wristwatch. 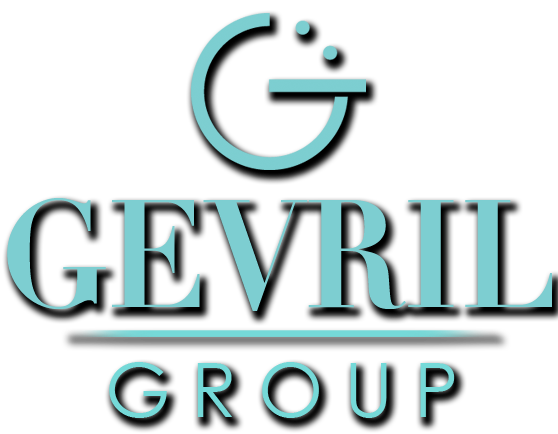 As far back as 1905, the company began producing ladies wristwatches from specially adapted small pocket watches. In 1930, the company introduced the world’s smallest baguette caliber, which delighted women around the world with its diminutive elegance. 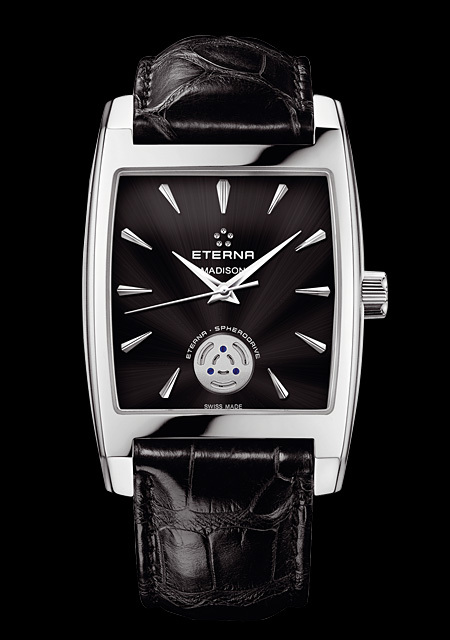 In 1950, Eterna made history again, introducing the world’s smallest self-winding movement. Throughout the company’s history, Eterna has developed a reputation for the precision of their superlative slim watch movements. 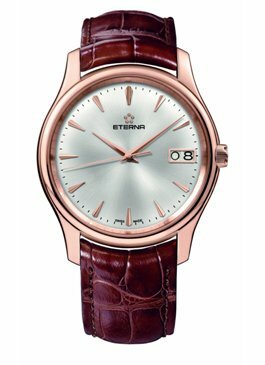 Many watch aficionados agree that nobody makes a better woman’s watch than Eterna. 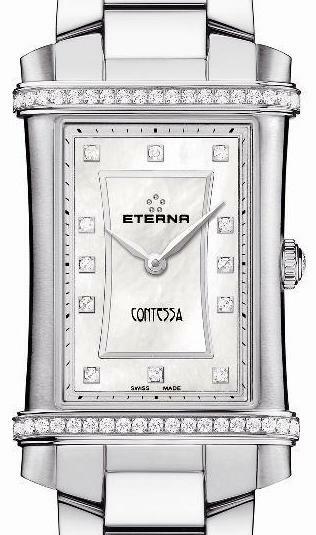 The new Eterna Contessa Collection builds on this unique 150-year heritage by redefining the ladies watch for today’s strong, independent woman. This striking Art Deco design is distinctly feminine, while remaining completely pragmatic with multiple strap and dial options. The detail and finish of the Contessa is simply superb. There are subtle textures in the dial that catch the eye and evoke an immediate emotional response. It’s hard not to notice the beautiful faceted diamond that adorns each crown as well. This lovely and very wearable timepiece proves that it is possible to have a fashionable, luxurious watch that doesn’t completely overwhelm the wearer. Anyone who appreciates understated luxury will love the new Eterna Contessa Collection. The watch is available in a variety of models that provide a choice of dial and strap options. If you are interested in acquiring one of these unique, luxurious watches for yourself, contact your Eterna dealer immediately and reserve your Contessa today.